I've been busy trying to get a couple more items ready for the shop. This is a new pattern for me by Farbenmix called the Vida jumper. 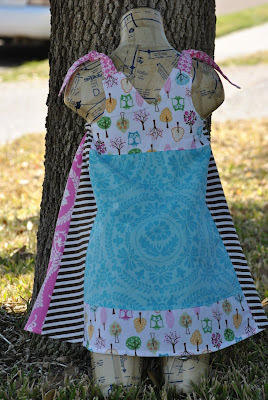 I used a combination of Jennifer Paganelli fabrics with a sheet from Pottery Barn. I love all the fabric and trim options this pattern allows. I switched up the pattern's button straps for ties to allow room for growth, and because I just think they are cute. 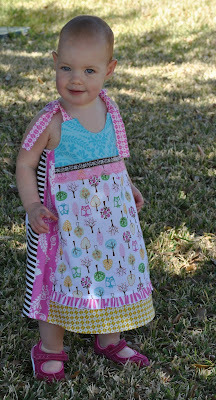 I used almost the same fabrics in different ways to sew up one for Avery too. I like to call this outfit her "passionate for purple" set. My favorite color is purple, so this bright combo makes me smile. 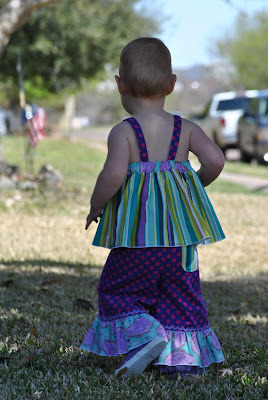 I used Simplicity pattern 4203 for the top and Portabellopixie's ruffle pants for the bottoms. I added a little pocket detail on the back of the pants. 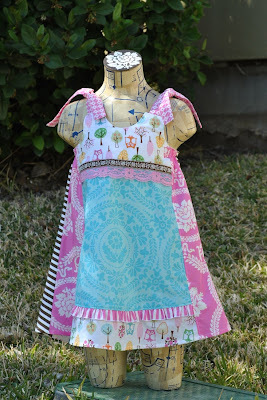 The fabrics are from Michael Miller and Sandi Henderson. Avery was a trooper for the photos since it was probably still in the 60's while we tried to capture these photos. (Don't worry, we had her coat on her minutes later.) Avery sure kept Liz on her toes trying to snap pictures while she ran about. Check out the shop for the new listings. Love your Vida! Great fabric combos. And this is so funny. 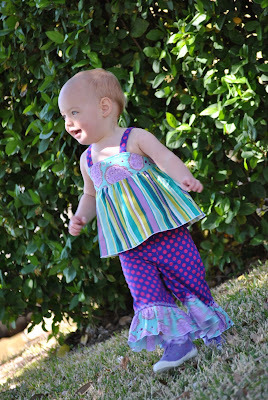 I have the same patterns for the second outfit and the same fabrics! Very cute.